With ongoing delays to construction of Class 377/5 units due to non delivery of sub-assemblies and parts by 's sub-contractors affected by the "credit crunch", it will not be possible to have all 23 units of the sub-class available for the Thameslink Project "Key Output Zero" deadline of being service on 23rd March. 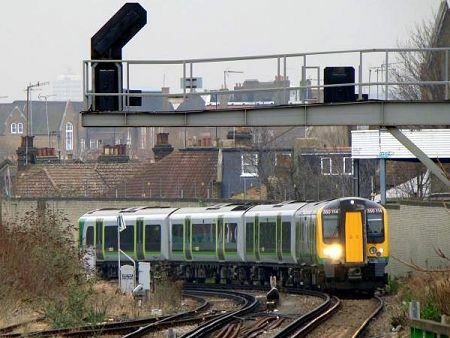 It is believed that all 15 Class 377/2 units will be loaned by to , with 's East Croydon - Milton Keynes service being run by Class 350/1 units (4 units required). Class 350/1 four car dual-voltage/pickup Desiros are the diverted five car part of an order originally intended for and were tested and gained their safety case on the South West Division, though they have not until now operated dc services. Accordingly 350114 was delivered from Siemens' Northampton depot to 's Selhurst depot on 24th February for staff training and testing. Given the lack of prior dc running this journey was flawless, save running early! 350112 arrived at Selhurst two days later. 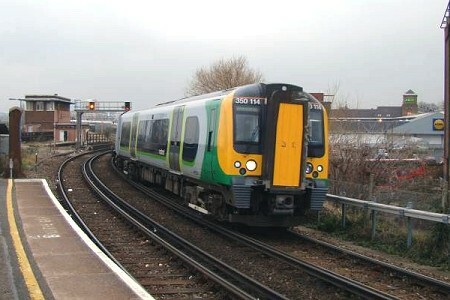 (left) and (below left) 350114 approaching and running through platform 17 at Clapham Junction on 24th February 2009.